Reissue on 180-gram opaque white vinyl. Originally released in 1965. Original released in 1965 on LP on ESP as catalog code 1010. Recorded live at Town Hall, NYC on May 1, 1965. "Albert Ayler (born July 13, 1936 - November 25, 1970) was an American avant-garde jazz saxophonist, singer and composer. After early experience playing R&B and bebop, Ayler began recording music during the free jazz era of the 1960s. However, some critics argue that while Ayler's style is undeniably original and unorthodox, it does not adhere to the generally accepted critical understanding of free jazz. In fact, Ayler's style is difficult to categorize in any way, and it evoked incredibly strong and disparate reactions from critics and fans alike. His innovations have inspired subsequent jazz musicians. His trio and quartet records of 1964, such as Spiritual Unity and The Hilversum Session, show him advancing the improvisational notions of John Coltrane and Ornette Coleman into abstract realms where whole timbre, and not just mainly harmony with melody, is the music's backbone. His ecstatic music of 1965 and 1966, such as "Spirits Rejoice" and "Truth Is Marching In", has been compared by critics to the sound of a brass band, and involved simple, march-like themes which alternated with wild group improvisations and were regarded as retrieving jazz's pre-Louis Armstrong roots. Born in Cleveland, Ohio, Ayler was first taught alto saxophone by his father Edward, who was a semiprofessional saxophonist and violinist. Edward and Albert played alto saxophone duets in church and often listened to jazz records together, including swing era jazz and then-new bop albums. 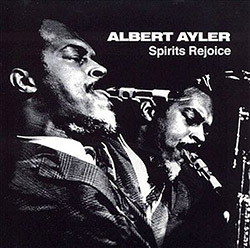 Ayler's upbringing in the church had a great impact on his life and music, and much of his music can be understood as an attempt to express his spirituality, including the aptly titled Spiritual Unity, and his album of spirituals, Goin' Home, which features "meandering" solos that are meant to be treated as meditations on sacred texts, and at some points as "speaking in tongues" with his saxophone. Ayler's experience in the church and exposure to swing jazz artists also impacted his sound: his wide vibrato was similar to that of gospel saxophonists, who sought a more vocal-like sound with their instruments, and to that of brass players in New Orleans swing bands. Ayler attended John Adams High School on Cleveland's East Side, and graduated in 1954 at the age of 18. He later studied at the Academy of Music in Cleveland with jazz saxophonist Benny Miller. Ayler also played the oboe in high school. As a teenager, Ayler's understanding of bebop style and mastery of standard repertoire earned him the nickname of "Little Bird", after Charlie "Bird" Parker, in the small Cleveland jazz scene. In 1952, at the age of 16, Ayler began playing bar-walking, honking, R&B-style tenor with blues singer and harmonica player Little Walter, spending two summer vacations with Walter's band. In 1958, after graduating from high school, Ayler joined the United States Army, where he switched from alto to tenor sax and jammed with other enlisted musicians, including tenor saxophonist Stanley Turrentine. Ayler also played in the regiment band, along with future composer Harold Budd. In 1959 he was stationed in France, where he was further exposed to the martial music that would be a core influence on his later work. After his discharge from the army, Ayler tried to find work in Los Angeles and Cleveland, but his increasingly iconoclastic playing, which had moved away from traditional harmony, was not welcomed by traditionalists. In 1963, Ayler returned to the US and settled in New York City, where he continued to develop his personal style and occasionally played alongside free jazz pianist Cecil Taylor. 1964 was the most well-documented year of Ayler's career, during which he recorded many albums, the first of which was Witches and Devils in March of that year. Ayler also began his rich relationship with ESP-Disk Records in 1964, recording his breakthrough album (and ESP's very first jazz album) Spiritual Unity for the then-fledgling record label. ESP-Disk came to play an integral role in recording and disseminating free jazz. Spiritual Unity featured the trio that Ayler had just assembled that summer, including bassist Gary Peacock and drummer Sunny Murray. The liner notes of Spiritual Unity include a brief description of the musicians on that day, July 10, 1964, in the Variety Arts Recording Studio. 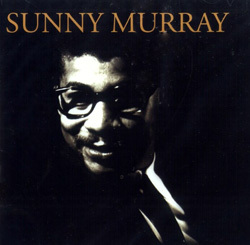 Just before 1 PM, Sunny Murray arrived, a large, genial walrus....Gary Peacock was next, tall, thin, ascetic looking, and soft spoken....Albert Ayler was last, small, wary, and laconic. On July 17, 1964 the members of this trio, along with trumpet player Don Cherry, alto saxophonist John Tchicai, and trombonist Roswell Rudd, collaborated in recording New York Eye and Ear Control, a freely improvised soundtrack to Canadian artist and filmmaker Michael Snow's film of the same name. During this time, Ayler began to garner some attention from critics, although he was not able to foster much of a fan following. 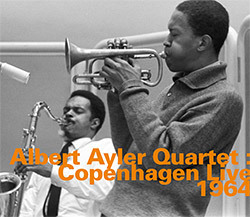 However, later in 1964, Ayler, Peacock, Murray, and Cherry were invited to travel to Europe for a brief Scandinavian tour, which too yielded some new recordings, including The Copenhagen Tapes, Vibrations, and The Hilversum Session. 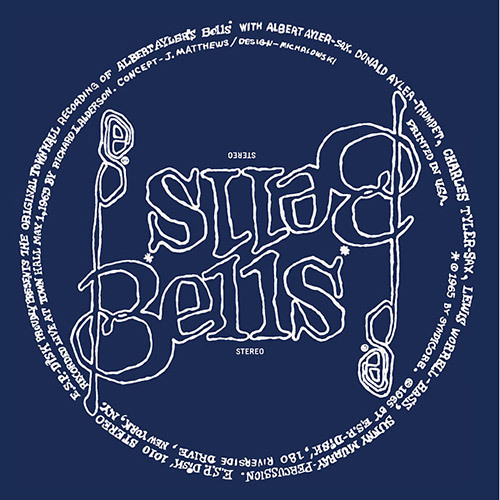 Ayler recorded Bells on May 1, 1965. 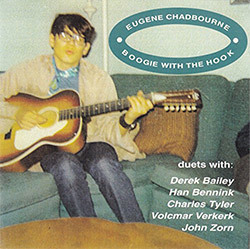 It is a ferociously-paced 20-minute improvisation featuring his signature military-march influenced melodies. Spirits Rejoice was recorded on September 23, 1965 at Judson Hall in New York City, and features a much larger band than the sparse trio of his earlier album Spiritual Unity. The Encyclopedia of Popular Music describes Spirits Rejoice as a "riotous, hugely emotional and astonishingly creative celebration of the urge to make noise." 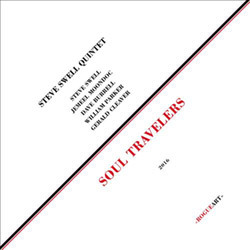 Both albums feature Albert's brother, trumpet player Donald Ayler, who translated his brother's expansive approach to improvisation to the trumpet. Donald played with Albert until he experienced a debilitating nervous breakdown in 1967. 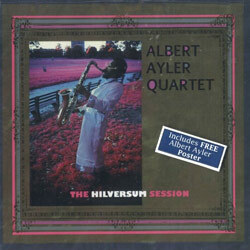 In 1966 Ayler was signed to Impulse Records at the urging of Coltrane, the label's star attraction at that time. But even on Impulse, Ayler's radically different music never found a sizable audience. 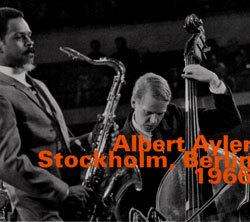 Ayler's first set for Impulse was recorded a few weeks before Christmas in 1966, entitled Albert Ayler in Greenwich Village. Ayler performed with his brother, Michel Samson, Beaver Harris, Henry Grimes, and Bill Folwell, and his Coltrane was in attendance. For a tune titled "For John Coltrane," Ayler returned to the alto saxophone for the first time in years. For the next two and half years Ayler began to move from a mostly improvisatory style to one that focused more closely on compositions. This was largely a result of pressures from Impulse who, unlike ESP-Disk, placed heavier emphasis on accessibility than artistic expression. In 1967 and 1968, Ayler recorded three LPs that featured the lyrics and vocals of his girlfriend Mary Maria Parks and introduced regular chord changes, funky beats, and electronic instruments. Ayler himself sang on his album New Grass, which hearkened back to his roots in R&B as a teenager. 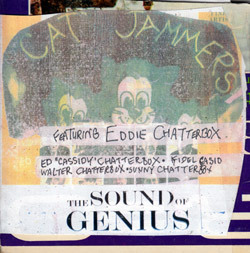 However, this album was remarkably unsuccessful, scorned by Ayler fans and critics alike. 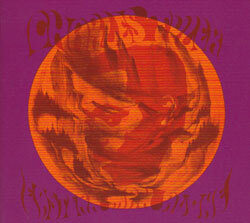 Ayler staunchly asserted that he wanted to move in this R&B and rock-and-roll direction, and that he was not simply succumbing to the pressures of Impulse and the popular music of that day, and it is true that Ayler heavily emphasizes the spirituality that seems to define the bulk of his work. 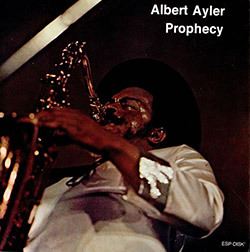 New Grass begins with the track "Message from Albert," in which Ayler speaks directly to his listener, explaining that this album was nothing like his ones before it, that was of "a different dimension in [his] life." He claims that, "through meditation, dreams, and visions, [he has] been made a Universal Man, through the power of the Creator..."
In 1968, Ayler submitted an impassioned, rambling open letter to Cricket magazine entitled "To Mr. Jones-I Had a Vision," in which he describes startling apocalyptic spiritual visions. He "saw in a vision the new Earth built by God coming out of Heaven," and implores the readers to share the message of Revelations, insisting that "This is very important. The time is now." His final album, Music Is the Healing Force of the Universe, featured rock musicians such as Henry Vestine of Canned Heat alongside jazz musicians like pianist Bobby Few. This was a return to his blues-roots with very heavy rock influences, but did feature more of Ayler's signature timbre variations and energetic solos than the unsuccessful New Grass. In July 1970 Ayler returned to the free jazz idiom for a group of shows in France (including at the Fondation Maeght), but the band he was able to assemble (Call Cobbs, bassist Steve Tintweiss and drummer Allen Blairman) was not regarded as being of the caliber of his earlier groups. Ayler disappeared on November 5, 1970, and he was found dead in New York City's East River on November 25, a presumed suicide. For some time afterwards, rumors circulated that Ayler had been murdered, with a long standing urban legend that the Mafia tied him to a jukebox. Later, however, Parks would say that Ayler had been depressed and feeling guilty, blaming himself for his brother's problems. She stated that, just before his death, he had several times threatened to kill himself, smashed one of his saxophones over their television set after she tried to dissuade him, then took the Statue of Liberty ferry and jumped off as it neared Liberty Island. He is buried in Highland Park Cemetery in Beachwood, Ohio." "Donald Ayler (October 5, 1942 - October 21, 2007) was a jazz trumpeter and younger brother to saxophonist Albert Ayler. Born in Cleveland Heights, Ohio, he went on to work with his brother in the mid-1960s. In 1967 Donald had what he termed a "nervous breakdown", which affected his brother's life as well. In 1970 his brother's death affected him deeply. After that he did work with a septet in Florence, but remains best known for his connection to Albert. Donald appears in the documentary film My Name Is Albert Ayler where he talks about his and Albert's life, their music and their relationship. He is also featured in archival footage from concerts in Europe in 1966. The new sequences with him were filmed in Cleveland, Ohio in 2001 and 2002. Ayler suffered a sudden heart attack on Sunday October 21, 2007, and died at home in Northfield, Ohio." "The transitional "Bells" was just under 20 minutes, released originally as one side of a clear vinyl LP with the other side empty of music. 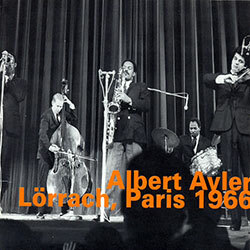 It was recorded at a May 1, 1965, Town Hall concert of ESP artists, displaying Albert Ayler's new group, which added Albert's brother Donald and Charles Tyler. The denser sound of "Bells" shows Ayler moving towards the bigger sonic statement made on Spirits Rejoice (ESPDISK 1020CD/LP), his September 23, 1965, Judson Hall session. 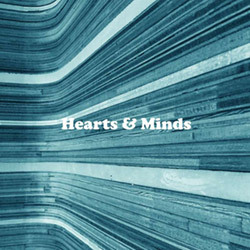 By the way, "Bells" as heard here is not, in fact, a single composition; rather, it is a medley moving from "Holy Ghost" to an unnamed theme and then into "Bells" proper. 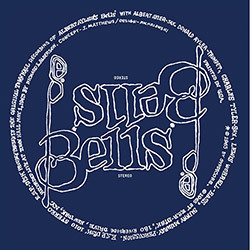 ESP-Disk' founder Bernard Stollman was so excited by "Bells" that it was released without delaying to record additional music to fill the other side of the LP. 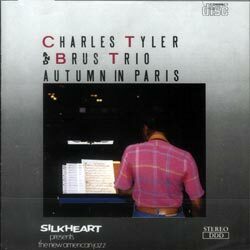 Both Donald Ayler and Charles Tyler were making their recorded debuts; Tyler would go on to record for ESP as a leader (Charles Tyler Ensemble (ESPDISK 1029CD, 1966), and Eastern Man Alone (ESPDISK 1059CD, 1967)). One vinyl pressing of Spiritual Unity (ESPDISK 1002CD/LP) in the '60s substituted a different track for "Spirits." Mr. Stollman had no memory of how this had happened, but it was subsequently corrected and became a rarity known only to rabid collectors and ESP fanatics. The one that is on all the CDs (except for one Japanese release with both) and all the rest of the vinyl editions is the same tune as what is titled "Saints" on Witches & Devils (aka Spirits, recorded on February 24, 1964). The anomalous substitution, which does sound somewhat similar, is the same tune known as "Vibrations" on the album Vibrations (aka Ghosts) and as "[tune Q]2" in Revenant's Holy Ghost boxed set.